Over their 40+ years of existence, The Fabulous Thunderbirds have evolved, both in terms of personnel and music. Starting out as one of the finest Texas roadhouse blues band with an irresistible mix of Texas, New Orleans, and Gulf Coast blues and R&B, in recent years the T-Birds have expanded into deep and greasy southern soul. Their last release, 2013’s On The Verge, was their first in eight years, and definitely had strong leanings toward soul. Their new release, Strong Like That (Severn Records), continues in that vein, and more so. Singer/harmonica player Kim Wilson is the lone remaining founding member, and only guitarist extraordinaire Johnny Moeller remains from On The Verge, but the new members fill the gap just fine, thank you. Keyboardist Kevin Anker, bassist Steve Gomes, and drummer Robb Stupka have long been a part of the Severn team as writers, performers, and producers (Anker and Gomes co-produced the album with Wilson and David Earl) and this blend of soul and blues is part of their musical DNA. Strong Like That features ten songs, two penned by Wilson, one by Gomes, and seven covers that alternate between well-known and seldom heard. The opener is a reading of the Temptations’ ’60s hit, “(I Know) I’m Losing You,” that transforms the soul classic into a downbeat blues, successfully enabled by Wilson’s edgy, somewhat paranoid vocal and the haunting steel guitar of Roosevelt Collier and relentless beat rhythm from drummer Wes Watkins. There’s also a pair of covers from the criminally underrated soul singer/composer Paul Kelly (“Don’t Burn Me” and “You’re Gonna Miss Me”), one of which features guest Anson Funderburgh on lead guitar. Other covers include “Drowning On Dry Land,” “Somebody’s Getting It,” “Where’s Your Love Been,” and I’ve Never Found A Girl (To Love Me Like You Do),” associated with O.V. Wright, Johnnie Taylor, Sandra Rhodes, and Eddie Floyd, respectively. On these songs and others, the T-Birds’ funky rhythms are punctuated by a crisp horn section (Kenny Rittenhouse – trumpet/arranger, Joe Donegan – trumpet, Antonio Orta – tenor sax/flute, Bill Holmes – trombone), and lively background vocals (Christal Rheams, Caleb Green, Sara Mia). The three originals are keepers, too. Wilson’s pair of tunes include the upbeat “Smooth” and “Meet Me On The Corner,” the most blues-centric cut on the disc. His harp runs are more plentiful this time around and he continues to prove that he is one of the finest living (or non-living) harmonica players. Gomes wrote the title track, a defiant midtempo number with a funky backdrop that closes things out. 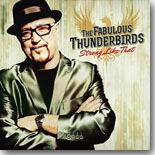 Strong Like That continues The Fabulous Thunderbirds’ exploration of the soul side of the blues most successfully. Though the emphasis is on the soul side, the blues still burns hot within.